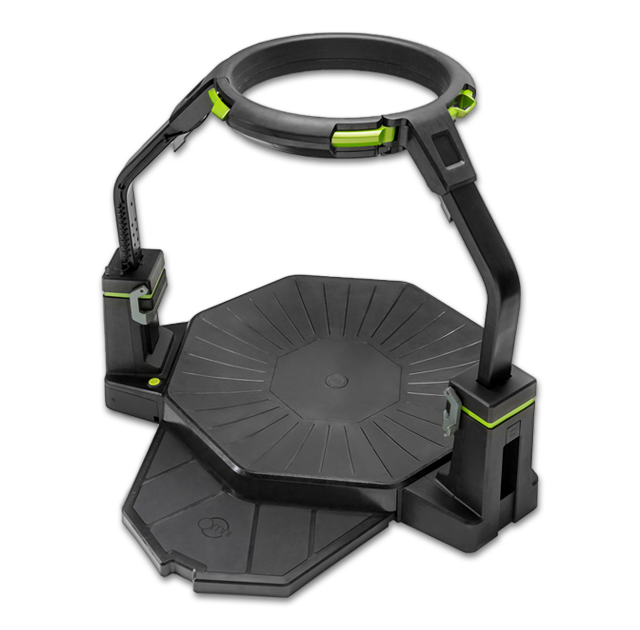 The Virtuix Omni™ is the first-of-its-kind VR motion platform that lets you walk and run around in virtual reality games and application. With over 3,000 Omnis shipped to over 500 commercial locations, the patent-protected Omni system is the leading and most popular VR platform on the market. Each Omni comes with Omniverse™, your home for 18+ diverse and exciting VR games your customers can choose from. Walk and run at full speed in 360° without risk of falling or colliding with other people. Experience unparalleled gameplay action including sideways and backwards movement at your real-time physical speed. Enjoy multiplayer gameplay and endless VR worlds from within the Omni’s small footprint. Play more than 18+ of the world’s top VR games exclusively for Omni, thanks to Omniverse™. Track stats and revenues in real-time and operate your Omnis from a central console; Omniverse™ provides online tools to make your business successful. The Omni has undergone major design changes since our Kickstarter campaign in 2013 and is now a commercial product sold to commercial customers only. The Omni is no longer available to consumers, and the pricing of our Kickstarter and pre-order campaign is no longer applicable. The Omni can be purchased through one of our authorized distributors. See a complete list of authorized distributors here. Important note: Omni consumer units that were sold to Kickstarter and preorder customers, and Omni units purchased on the second-hand market, are not compatible with the Omniverse entertainment system and games. These units are not licensed for commercial use and will not receive technical support from Virtuix. To avoid incompatibility with games and other technical issues, purchase Omni systems from authorized distributors only. For pricing and availability of various Omni packages, please contact your local distributor. Pricing of a basic two-Omni package typically ranges from USD $20,000 to $25,000. Click here to find an authorized Omni distributor near you. For additional accessories that you may need, see our products page here.